So begins one young man’s journey to understand and reconsider the Bible’s true position on baptism. When William marries into a church denomination that is very different from his own, he finds himself struggling to reconcile two opposite views on baptism. Through a series of conversations with a wise, older pastor, William strips away his preconceptions about baptism and returns to the plain, clear truth that the Bible teaches. James Chaney first used this unique format of personal dialogue to explore baptism and its modes in this timeless book, and his observations are just as powerful and needed today. He sheds light on a controversial topic by confining his argument to the Word of God alone, first examining the meaning of baptism through its uses in Scripture, then exploring the significance of the ceremony, and finally examining the evidence of cases of baptism in the New Testament. "An enlightening read. 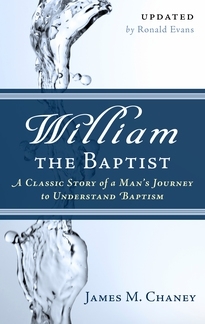 With warmth and imagination, Chaney winsomely guides readers through the Bible's teaching on baptism. An invaluable resource." "A narrative that is fast-moving and biblically engaging, here is a page-turner that Ron Evans has enhanced by updating it into today's language. An intriguing short read with lifelong implications."